Micho Sredojevic says pushing their wingbacks forward in the second half paid dividends for them as Orlando Pirates beat Free State Stars. Bucs edged Ea Lla Koto 2-1 to extend their lead at the top of the Absa Premiership table at the Orlando Stadium on Saturday night. 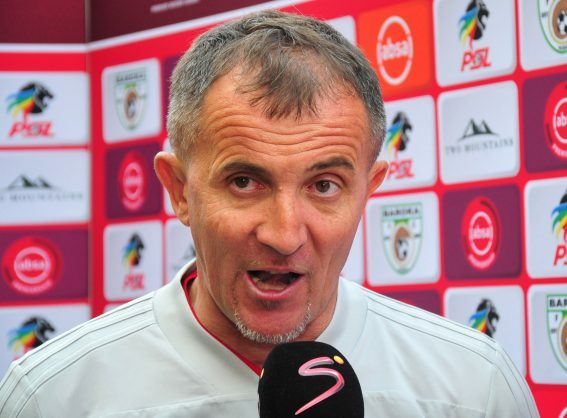 Going up against his countryman Nikola Kavazovic’s side, the Bucs coach went on to say that he had expected a tactical game from the Free State outfit. However, it was Bucs who walked way with a victory on the night as they went six points clear at the top ahead of Mamelodi Sundowns and Bidvest Wits, who are both on 44 points, but Downs have three games in hand having been busy with their Caf Champions League schedule. “We knew that we are going to have a very tactical game, and the field was so slippery. We had patient build-ups in the first half to try and find spaces, but it wasn’t meant to be. “At half-time we agreed we would push our fullbacks higher, it paid us back with Innocent Maela and on the other side. We got exactly what we wanted with two quick goals. The Bucs coach went on to explain his substitutions, adding that he was looking to stabilise the game. The loss was a huge blow for Ea Lla Koto, who are trying to escape relegation. Stars are 15th with 24 points, four points away from automatic relegation with five games remaining.